Once the ceremony's over and before the dancing's started most of your guests' time will be spent chatting, eating and drinking around their tables. That's why it's vital to make sure they've got some great decorations to admire in the course of the festivities. Here's some great ideas for centrepieces that'll break the conversational ice and make sure your tables are even better dressed than the bride. Beautiful, varied and easy to match to with the colour scheme, it's no wonder floral centrepieces are still the most popular choice to grace reception tables. Whether you're opting for a traditional or modern look, there's a way of using flowers that will tie in perfectly. For an elegant, romantic feel, ask your florist about creating wired shapes using traditional flowers - cones of roses, wreaths of orange blossom or pomanders of sweet-smelling blooms - instead of simply bunching them into vases. However, modern arrangements need the right containers to set them off. Try single gladioli in tall glass vases, tight bunches of tulips in square jars, or shallow bowls of water filled with multi-coloured petals. Those on a budget can consider using artificial flowers rather than real ones, which are easier to manipulate and come in a huge variety of colours. They can also be saved or given to guests as a souvenir of the big day. 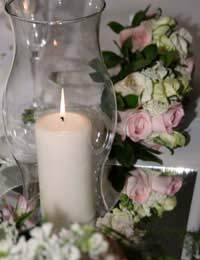 Beware, though, if you're planning on putting candles near the centrepiece - you'll need to spray the 'flowers' with a fireproofing product. A centrepiece of candles has the added benefit of providing light for each table. If you're planning to use candles as a primary light source, create centrepieces that contain more than one wick so nobody's straining to see. Give tall, classical candles a modern twist by putting them into interesting containers - wine bottles, old perfume vials or glass bud vases will all support them adequately and ensure no wax gets onto the tablecloth. A pyramid of different-sized church candles gives an elegant effect, while there's noting more romantic than floating tea-lights placed in a large bowl of water.If you've got the budget, invest in 'smokeless' candles or oil-based versions, which don't create clouds of smoke that could obscure the guests' views or put them off while eating. Leave a box of matches at each table too, in case the flames go out. No longer the preserve of children's parties, balloons, are making a comeback as the ultimate in budget decoration. By keeping the colours muted and opting for metallic or pearlised styles, you can create an effect that won't look out of place at all. Allow three balloons for each table. Inflate them using helium gas, which is lighter than air, meaning the balloons will pull upwards rather than outwards. Tie ribbons of different lengths to the end of the balloons and fasten them to a small weight (these can be bought specially or made by putting sand into bags of cloth), which is placed in the centre of the table. The varied lengths of the ribbons mean the balloons will rise in an attractive 'tiered' effect, and won't bump into each other once in place. If you'd love to have fresh flowers but can't afford them, consider putting pot plants into decorative holders and placing one on each table. At the other end of the financial scale, individual bonsai trees look fabulous and can be given away to the bridal party afterwards. If you're holding a wedding with a theme, the table centrepiece is an excellent place to tie it in with your decorations. A beach wedding, for example, could employ a square glass vase filled with shells, a miniature palm tree or a scaled-down paper sun parasol. Children won't appreciate an aesthetically attractive table centrepiece, and will need something to amuse them during the speeches. Cover the table with white paper, then fill a vase with pens and pencils and encourage youngsters to draw on the 'tablecloth'. Alternatively, you can fill a wide-necked container with sweets - although some parents may not appreciate their kids having access to so much sugar! Finally, why not use your centrepiece as a way of distributing wedding favours to guests? Fill glass containers with chocolates, hang small bags off a candelabrum, or turn the gift-giving into a game by hiding packages in a tub filled with shredded paper as a 'lucky dip' for your lucky guests!